Chondral lesions of the talus are usually caused by acute ankle sprain or a chronic ankle instability due to insufficiency of the passive lateral ankle stabilizers. In most of the patients, the lesion remains asymptomatic for a long period of time. Pain, the first clinical symptom of the lesions, usually starts when subchondral bone is affected by the repetitive microtrauma and the chondral lesion becomes an on osteochondral lesion. That is why the patient who qualifies to be treated operatively usually has an osteochondral lesion that needs a bilayer reconstruction. In those cases a technique that is a combination of both bone and cartilage reconstruction is recommended. The biological osteochondral reconstruction (BIOR) technique allows the surgeon to not only treat the cartilage but also the underlying bone. 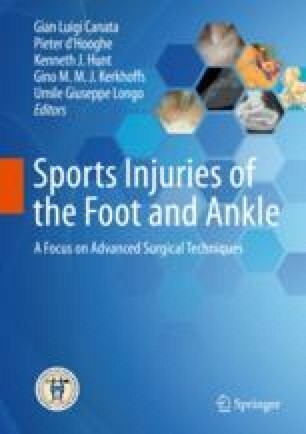 In severe cases of osteochondral lesion, a sophisticated reconstruction of the talar dome shape is needed in order to regain the ankle joint congruency. Sadlik B, et al. Surgical repair of osteochondral lesions of the talus using biologic inlay osteochondral reconstruction: clinical outcomes after treatment using a medial malleolar osteotomy approach compared to an arthroscopically-assisted approach. Foot Ankle Surg. 2018. https://doi.org/10.1016/j.fas.2018.02.010.